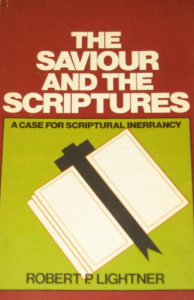 Here is a good read from a generation ago on the inspiration and infallibility of Scripture and the battles that have been fought over the last 100 years. Lightner wrote this in 1966 and updated it in 1978. At the time he was professor of Systematic Theology at Dallas Seminary as well as an outspoken advocate of conservative thought and was well known for his 1958 book Neoeangelicalism which was later published by Regular Baptist Press in 1978 as Neoevangelicalism Today. This volume was actually a printed edition of Ligthtner’ ThD dissertation at Dallas Seminary. In it he gives in great detail the Lord Jesus’ view on Scripture from the gospels. He shows how the Lord endorsed inspiration of the whole Scripture, the parts of Scripture, the very words of Scripture, and also the very letters of Scripture (in the autographs). Then he deals with three current (in his day) departures from the orthodox view of inspiration: Neo-orthodoxy, Neo-liberalism, and Neo-evangelicalism, with a final chapter on “Dangers for the Fundamentalist.” In a “further developments” section at the end Lightner adds warnings of contemporary movements such as Richard Quebedeaux’s The Worldy Evangelicals and Young Evangelicals. He also shows significant departures form an orthodox view of Scripture by Inter-Varsity, Young Life, Billy Graham Association, and other new evangelical organizations including feminists and charismatics. I realize that these warnings and evaluations come from a generation ago and by now the evangelical world has fully glossed over such things and also that fundamentalism has been made the boogey man for even criticizing them. But I think Lightner’s quotation by J. Harold DeWolf (a neoliberal thinker) is very prophetic as to how this all would affect our own generation: “The insistence of some conservative Christians on a Biblical literalism that is rationally indefensible and an appeal based on the ‘proofs’ of prophecy and miracles, in defiance of the Biblical times, needlessly drives from the Christians faith intelligent young people who will not blind themselves to scientific and historical evidences” (p. 135). How true this has become in today’s young evangelicals.